Last major update issued on April 10, 2010 at 05:50 UTC. The geomagnetic field was quiet to unsettled on April 9. Solar wind speed ranged between 387 and 520 km/s. Solar flux measured at 20h UTC on 2.8 GHz was 76.0. The planetary A index was 6 (STAR Ap - based on the mean of three hour interval ap indices: 6.5). Three hour interval K indices: 32111111 (planetary), 33221211 (Boulder). 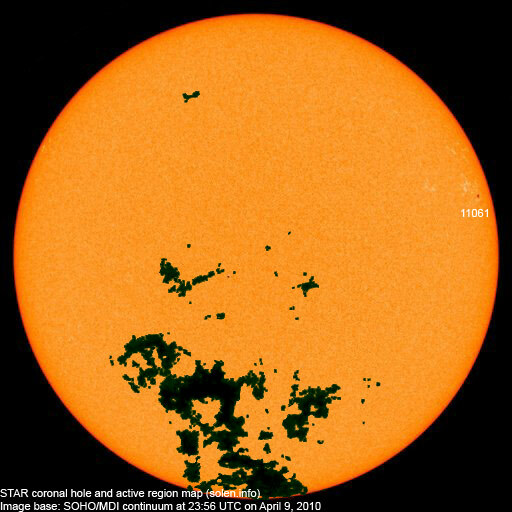 Region 11061 decayed slowly and will rotate off the visible disk late today. April 7 and 9: No obvious Earth directed CMEs were observed in LASCO or STEREO images. April 8: LASCO observed a faint full halo CME following a long duration B3.7 event in region 11061 peaking at 03:25 UTC. Processed SOHO/EIT 195 image at 23:48 UTC on April 9. The darkest areas on the solar disk are likely coronal holes. 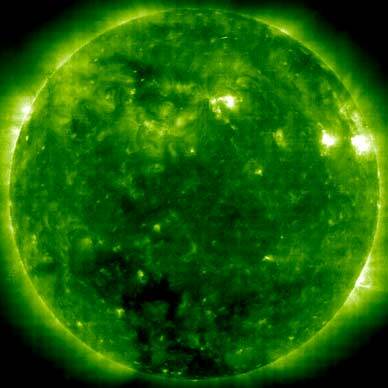 The geomagnetic field is expected to be quiet on April 10. Some unsettled and active intervals are possible on April 11 and 12 due to the passage of the CME observed on April 8.